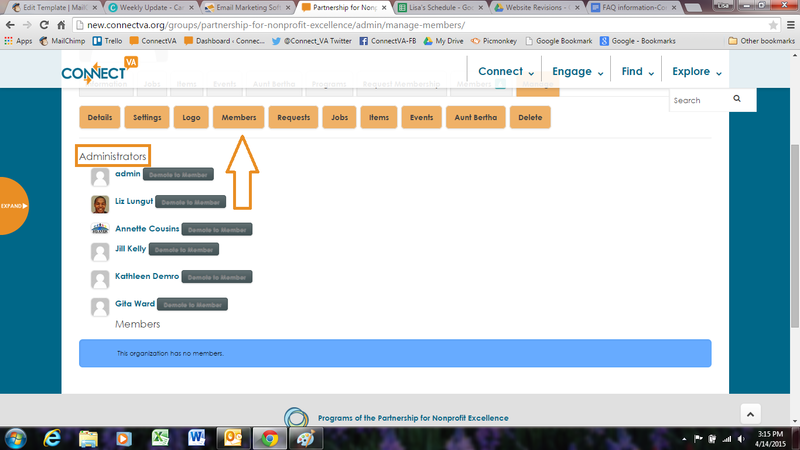 First, ensure your Dashboard is expanded (orange button), and click on Manage Organization. You should see your Organization(s) listed. Click on your Organization’s name, and then click on the Manage tab. 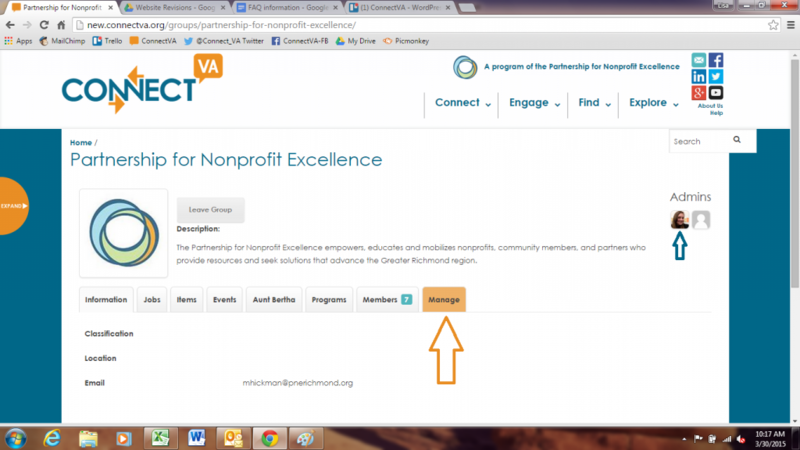 In the first tab, Details, you may edit your Organization Name, Description, Contact information, social media sites (up to three), HandsOn Greater Richmond Profile, and GiveRichmond Portrait. The Organization Description is the overview that will appear when ConnectVA users search for your Organization in the Organization Directory. You may preview this by clicking on the Information tab in your Organization’s profile. In the second tab, Settings, you may edit your Organization’s Privacy Options (who may join your organization as a Member/Administrator). 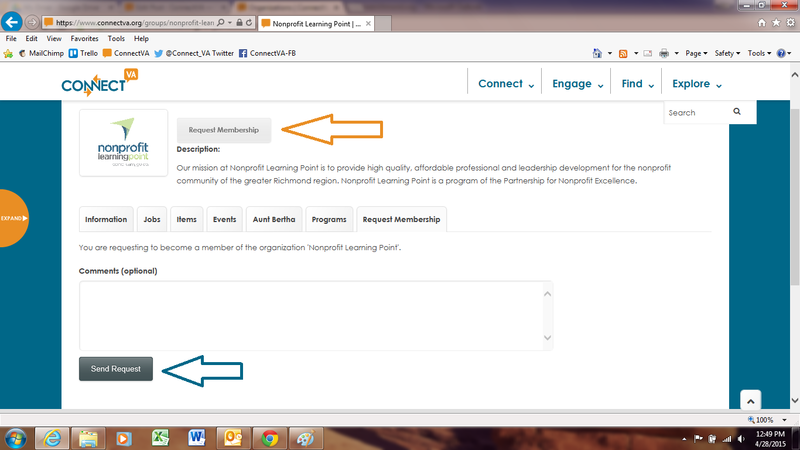 In the Members tab, you can view your current Administrators/Members. To view pending Membership Requests, click on the Requests tab. You may accept or decline a request. Important: All members are automatically approved as Administrators, so anyone listed as a member of your Organization can help maintain your Organization’s profile. Ensure your member has registered on ConnectVA and has updated his/her user profile. Have your member log in to his/her account, search for your Organization in the Organization Directory, click on the Organization name, and then Request Membership. In the Logo tab, you may update or add your Organization’s logo. To add, simply choose your photo file and upload the image. Crop to add your new logo. The logo editor accepts most photo file types and sizes, but a 72 dpi .png or .jpeg image is recommended. 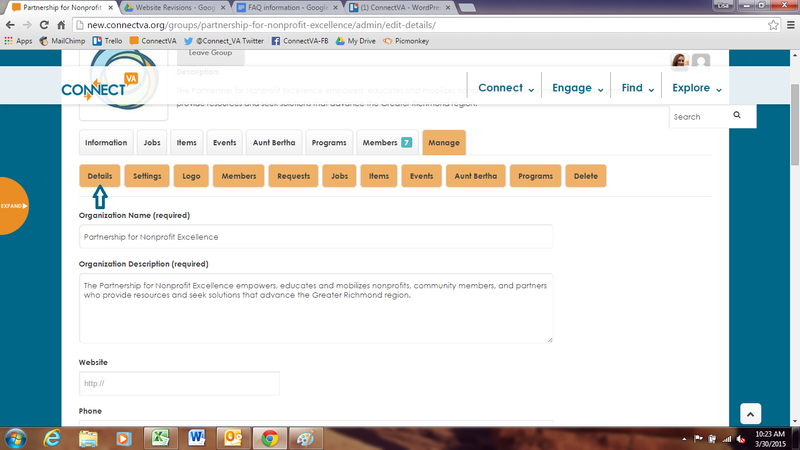 You can also show your Organization’s human service programs from your Aunt Bertha (Basic Needs Directory) listing in the Aunt Bertha tab. For more information about how to get your Organization listed on Aunt Bertha, visit our Help page. 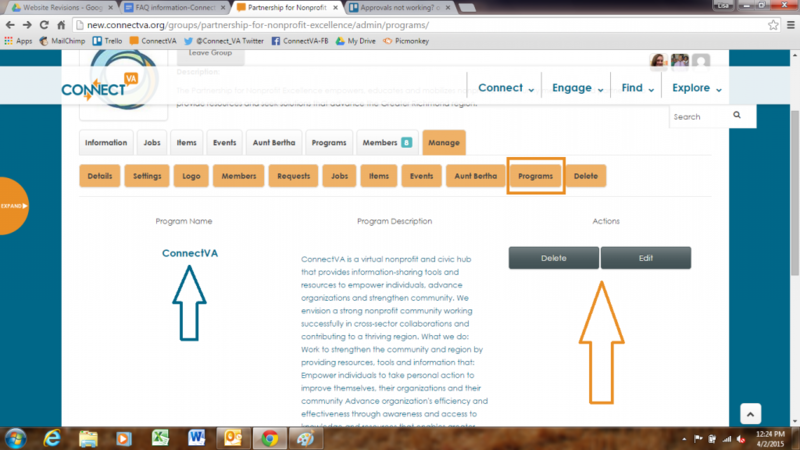 In the Programs tab, you can add and manage your Organization’s programs. 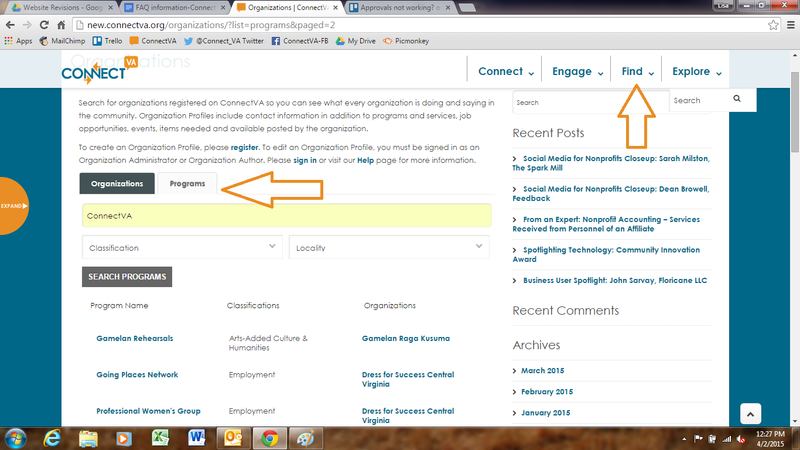 Programs are searchable in the Organization Directory. If your Organization already has a listed program, you will see the option to edit or delete that program. To add a new program, click on Add New and enter all of the program details. Click on the program name to view how your program appears in the directory. You may also navigate to the top of the screen, click on Find, Organizations, and then the Programs tab to search for your program. For additional assistance with managing your organization, visit our help page, or contact us.